Dozens of people were still missing and four in critical condition as torrential rain that has killed 20 people pounds western and central Japan, according to local officials. Intense rainfall triggered huge landslides and flash floods in Hiroshima, Okayama, Kyoto and other regions, while hampering rescue operations. Local authorities said on Saturday a total of 20 people were killed in rain-related accidents, while public broadcaster NHK said the death toll had risen to 38 with 50 others unaccounted for. The broadcaster also said that more than 1.6 million people had been ordered to evacuate from their homes. Japan’s Meteorological Agency retained special weather warnings for three prefectures in the main island of Honshu, down from five, and urged vigilance against landslides, rising rivers and strong winds amid what it called “historic” rains. Although a weather front had settled between western and eastern Japan, there was a risk that heavy rains would continue as warm air flowed towards the front with already-saturated areas facing more rain on Sunday, the agency said. In Motoyama, a town on Shikoku island about 600 km from Tokyo, 583 millimetres of rain fell between Friday and Saturday mornings. 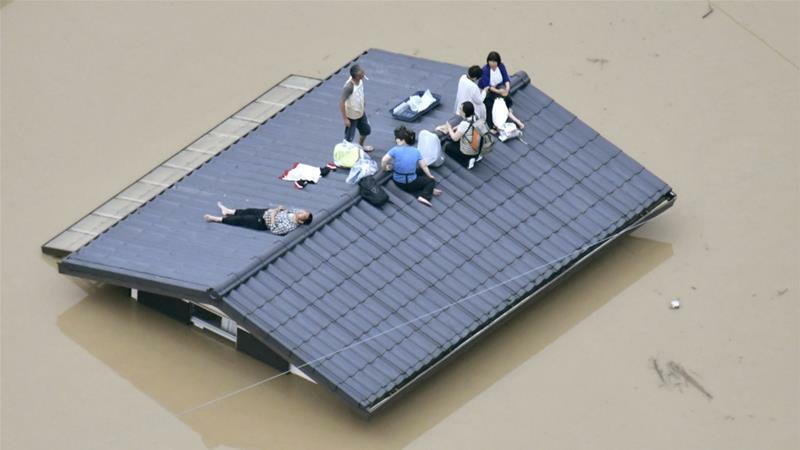 Minako Sakurai, an agency official, told reporters heavy rain was expected to continue until Sunday in western and eastern Japan. Some areas have been hit by more than a metre of rainfall, according to the government. Yoshihide Suga, chief cabinet secretary, said that about 48,000 troops, police and firefighters have been deployed for rescue operations.